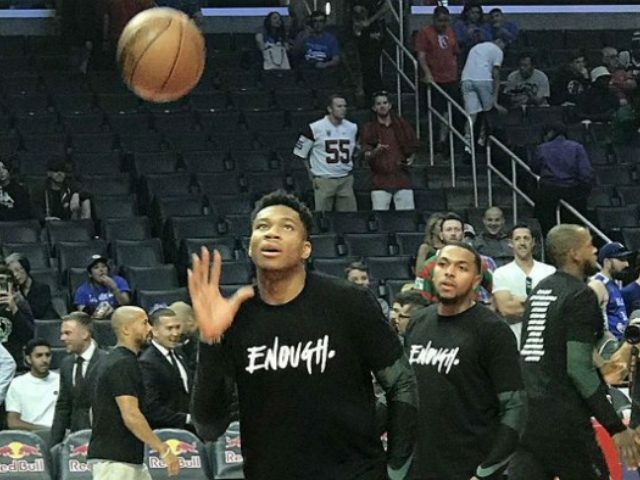 The Los Angeles Lakers and the Los Angeles Clippers wore gun control shirts during warm-ups, following last week’s shooting in Thousand Oaks, California. The shirts listed the names of the 12 victims who were shot and killed at Borderline Bar & Grill and the front of the shirts was emblazoned with “Enough,” the gun control mantra from Michael Bloomberg’s Everytown for Gun Safety. Neither the Lakers, Clippers, nor Kings pointed to a specific gun control they want to see passed. Perhaps that is because California already had nearly every gun control imaginable. The state has universal background checks, firearm registration laws, red flag laws, a requirement that would-be gun buyers first get a certificate of safety from the state, a 10-day waiting period for gun purchases, an “assault weapons” ban, a one handgun-a-month purchase limit, a “good cause” qualification for concealed carry permit issuance, a ban on campus carry, a ban on carrying guns in places that serve alcohol for consumption, and controls for ammunition purchases. The Borderline Bar & Grill gunman used a legally-purchased handgun.